Bring a large pot of salted water to a boil. Add the macaroni and cook until 2 minutes or so past al dente, you want it soft. Meanwhile, whisk together the mayo, milk, salt and pepper until well combined. Set aside. Drain the macaroni and allow to cool in a large bowl. Stir in the carrots and onion. Drizzle with dressing and stir to evenly mix all ingredients. Good right away or refrigerate 1 hour prior to serving. Longtime readers may remember that each New Year's Eve we have a theme night where we eat food, watch movies, drink, play games and music all focusing on that theme. For many years it was a different decade then we ran out of decades that had movies so we moved on to other themes. Last year was the Wild West and this year was Hawaii! So fun. Great movies, drinks and most of all, food! We made a ton of food to fit the theme and spread the party out over two days. We served this macaroni salad more than once and it was so good! Don't be put off by the amount of mayo, you really need it for that Hawaiian Mac Salad flavor. You also need to "overcook" the pasta a bit so it soaks up some of the dressing. We like it served with spam musubi, kalua pork where we eat food, watch movies, drink, play games and music all focusing on that theme. For many years it was a different decade then we ran out of decades that had movies so we moved on to other themes. Last year was the Wild West and this year was Hawaii! So fun. Great movies, drinks and most of all, food! We made a ton of food to fit the theme and spread the party out over two days. 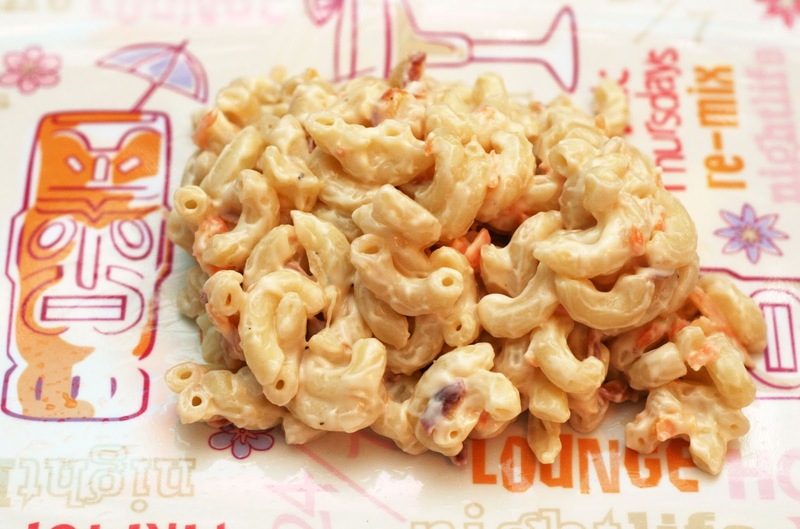 We served this macaroni salad more than once and it was so good! Don't be put off by the amount of mayo, you really need it for that Hawaiian Mac Salad flavor. You also need to "overcook" the pasta a bit so it soaks up some of the dressing. We like it served with spam musubi, kalua pork, garlic shrimp and even loco moco.